Attentional training and cognitive control: We study experience-dependent changes in attention and memory via mindfulness meditation training. 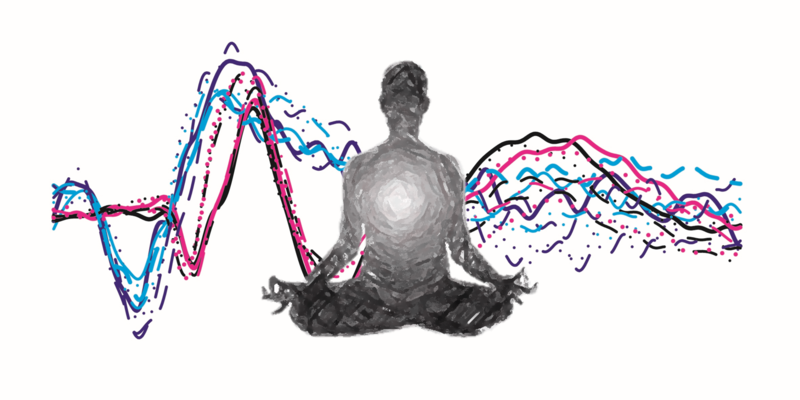 To investigate the cognitive benefits of meditation on attention and performance we measure ongoing neural processes using ERP, with a particular interest in how mindfulness meditation training affects cognitive control. Many aspects of all our projects are relevant to understanding selective attention, and visual and spatial memory. The bivalency effect: Imagine driving through the city and a red light flashes in your periphery while going through a green-light intersection. Even though the red flash is irrelevant for the task at hand (i.e. drive through the intersection), the red appearance of this flash cues a “stop” signal because of all your previous encounters with red stoplights. In response to these “bivalent” (i.e. cueing two tasks) stimuli, people slow down their responses to all other tasks for a significant period of time. In the present analogy, response times to changing lanes and staying vigilant to pedestrian encounters would also be slowed down. We seek to understand the cognitive control that leads to this response slowing and how our brains learn to anticipate future cognitive load. Note: Currently, we are NOT recruiting new graduate or undergraduate students for this project.